The lightwave section has a wavelength range of 1200 to 1600 nm, a detected modulation bandwidth of 100 kHz to 22 GHz, and a built-in RF amplifier. 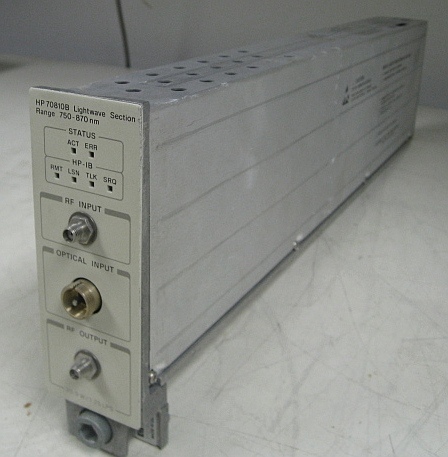 The Agilent 70810B lightwave section is a lightwave receiver module for the Agilent 70000 modular measurement system (MMS). Consisting of an optical attenuator, broadband photo-detector, microwave preamplifier, and optical power meter, the module combines with Agilent 70000 series spectrum analyzers.